Making marinades is so easy and often times, you may have the ingredients already in your pantry. For this recipe, fresh limes, chipotle chili pepper, olive oil, garlic powder and salt is all you'll need! If you have trouble finding chipotle chili pepper, you can use canned chipotle peppers in adobo sauce - just 1 tablespoon, finely minced. For those that don't like too much heat, reduce the amount of pepper down to 1 1/2 teaspoons or less. Combine all the ingredients except the ribs in a bowl. Whisk to fully combine. Place the ribs in a large storage bag and pour the marinade in. Seal the bag and chill for 2 hours for the meat to marinate. 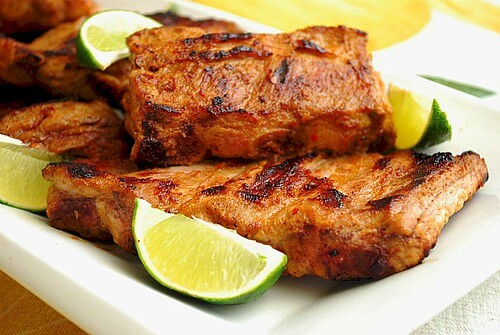 Place ribs onto grill, and cook until cooked through, 5 to 10 minutes depending on thickness of meat. Turn over, and continue cooking until golden on the other side, 5 to 10 minutes more. When finished, place ribs onto a platter, and allow to rest for 10 minutes. Garnish with lime wedges. I love chipotle and lime together as a flavor match so these sound fantastic. And seriously how can you ever go wrong with ribs!